The Ashley River winds through South Carolina’s Lowcountry and eventually joins the Cooper River to form the Charleston Harbor. The blackwater river, or freshwater river stained with tannins, begins in Berkeley County, flows to Summerville alongside Colonial Dorchester, and continues around 17 miles to the harbor before emptying into the Atlantic Ocean. 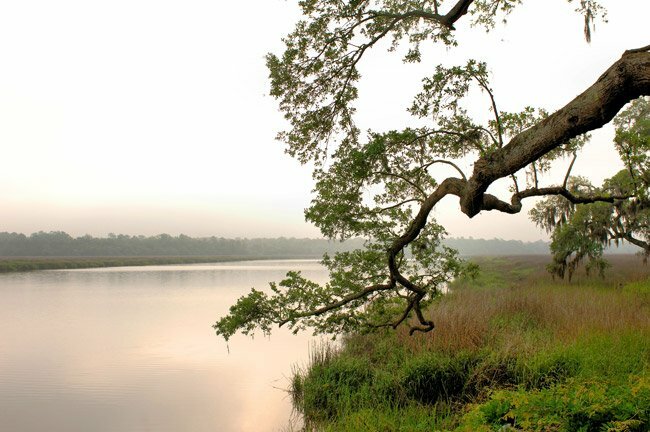 The Ashley River was the first designated South Carolina Scenic River in the Lowcountry. It was named for Anthony Ashley Cooper, who was Earl of Shaftesbury in the 1600s and one of South Carolina’s eight Lords Proprietors. Cooper was also an important philosopher of his time and, along with John Locke, wrote the Fundamental Constitutions of Carolina in 1669. At the time, the document was “the unalterable form and rule of Government forever” in Carolina. “Carolina” originally included all the land between present-day Virginia and Florida with no western boundary. The tidal river was ideal for growing rice, a crop that depends on regular submersion. Subsequently, English planters established rice plantations along the Ashley River from Summerville to Charleston, and several remain as museums. 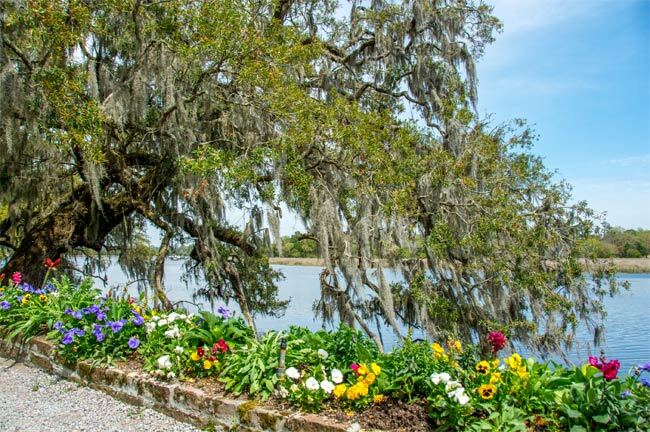 Middleton Place, Magnolia Plantation, and Drayton Hall are each open to the public and afford unadulterated views of the Ashley River. Remnants of rice fields are also visible along this Lowcountry river. The Ponds (seen below), a once private plantation located near Summerville, was a profitable rice producing property. The current house was built in the 1830s and was the third to stand on the property. The acreage around the house was sold in 2006 and developed into an upscale housing community. 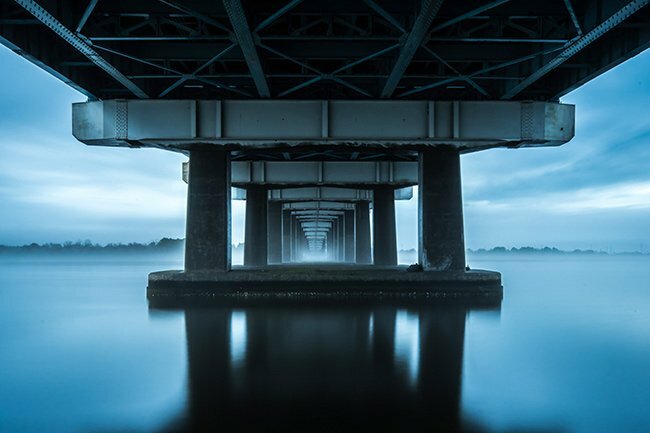 For many years, fishermen cast their nets and lines from the muddy banks of the Ashley River under the North Ashley River Bridge – more commonly called North Bridge – which connects the West Ashley area of Charleston to the City of North Charleston. In 2014, City of Charleston officials turned that muddy patch into Northbridge Park. The $1.5 million dollar project brought a kayak and canoe launch, bike racks, a dog-friendly area, a walking path that stretches under the bridge, security cameras, and a 271-foot aluminum fishing pier. Now the area near the bridge is a safely-accessible recreation area which allows residents to enjoy more of South Carolina’s abundant natural resources. Below is an historical photo of the old Bacon’s Bridge – for which a major road in Summerville is now named – crossing the Ashley River in Dorchester County. The photo is labeled “(Steven’s or) Bacon’s Bridge” because the bridge, which was public, was originally called Steven’s. It dated to at least 1722 and was maintained by fees from white males in the parish. Looking at the photo, the road leads into Summerville. The dam. The pumphouse to carry water above the dam [word(s) likely missing] pipes to ditch or canal which leads it thru Windsor Hill and between Inglesides and Woodstock to Goose Creek. Fort Dorchester also saw action during the Revolutionary War. The fort had been built at Dorchester Village as a powder magazine during the French and Indian War (1756-1753). When the Revolutionary War broke out, the fort was garrisoned by Francis Marion’s Second Regiement, and Dorchester Village was transformed into a military depot. There was little activity until early 1780. 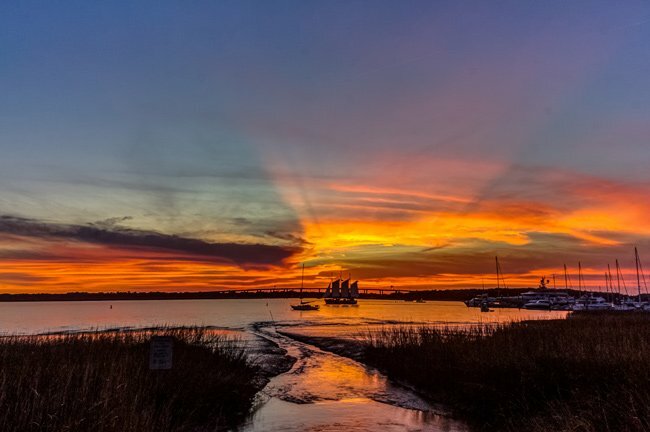 When the British siege of Charleston began, Americans assembled at Fort Dorchester for their mark to defend the city. 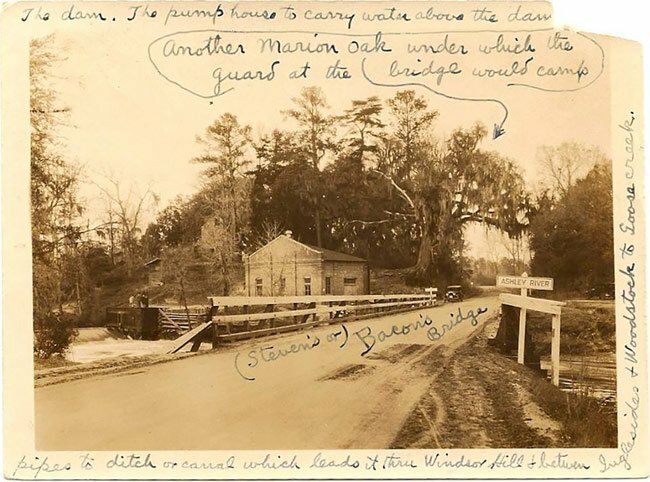 Into the twentieth century “Marion’s Oak” near Bacon’s Bridge was said to mark the place where General Francis Marion and his troops camped while guarding the crossing. 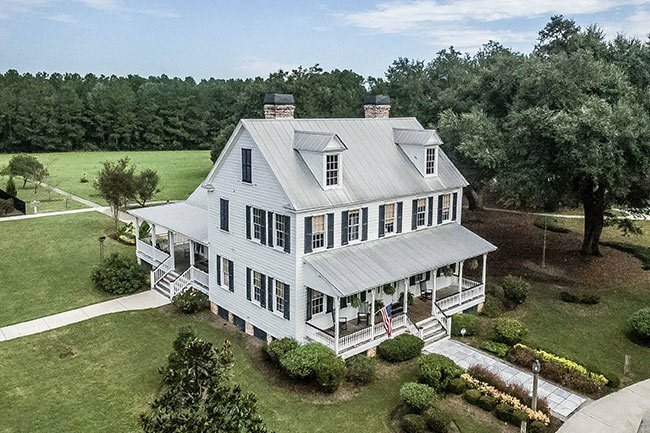 See Ingleside Plantation information about another nearby Marion Oak. Hi, Ellen. The photographers own the photos, so you will need their permission. If the photographs you are interested in do not have a link on the photographer’s name, let us know which photos you would like to use and we can hopefully get contact information to you. Great project! The James Island Elementary School’s K-4 class is doing an A -Z Charleston views and would like permission to use some of your photographs for their scrapbooks. Nice I want to see more!